>> trove of intelligence taken from osama bin laden 's pakistani compound. nbc's peter alexander is in islamabad . good morning to you. >> reporter: matt, good morning. evidence seized from osama bin laden 's compound here is, as you described it, the single largest collection of senior terrorist materials ever fwatherred. enough, they say, to fill a small college library and the u.s. released five videos. they do not have audio. bin laden looks less like the world's most wanted terrorist and a lot more like a prisoner in his own home. they are the late nest a long line of osama bin laden videos but these tapes the u.s. government wants you to see. armed only with a tv remote , a gray-bearded bin laden appears to be an old man watching video of himself, as one person described, reich like an aging actor. his surroundings are sparse. people say he remained an active leader of al qaeda even as he avoided detection for five years in a military town two hours outside islamabad . president obama believes bin laden had a support network inside pakistan. >> we don't know if there were people inside government, people outside government. that's something we have to investigate and the pakistani government has to investigate. 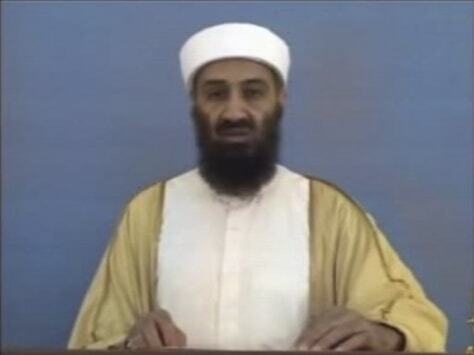 >> reporter: new video shows bin laden fumbling his statements, at times looking off camera for direction. we showed the video to a former head of pakistani intelligence who dismissed the clips as meaningless. >> this doesn't prove anything. it doesn't prove he's still in charge. >> reporter: is it possible osama bin laden lived in abbottabad for more than five years without the help of anyone within the pakistani intelligence or military? >> i'm certain it is possible. i am absolutely certain that the military or the isi did not provide him advice. >> reporter: no one would dare give him shelter, this man explains. they are still suspicious, with many unconvinced bin laden was killed. this afternoon, pakistan's prime minister is expected to make the first official statement about last week's events in a speech before parliament. meredith? Osama bin Laden is shown in a new video released by the Pentagon on Saturday.